ESSENTIAL RE-PRESS !!! 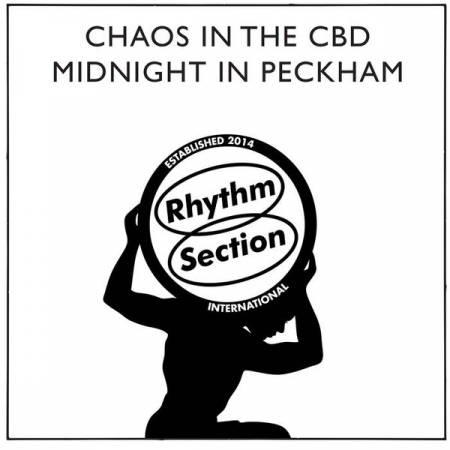 - Rhythm Section International proudly presents it's 8th offering from local boys Chaos in the CBD. Born in New Zealand, but based in Peckham for the last few years (literally just around the corner from Henry Wu and Bradley Zero), these brothers have made a real mark on the scene here in London town and with their latest set of productions are set to take this message further afield. Having already released internationally on labels such as ClekClekBoom (Paris), Hot Haus (London) and Amadeus (Montreal), the duo's approach to production has matured immeasurably in the last year, as is evident in the restrained potency and poetic subtlety on the 4 tracks across this accomplished EP, Midnight in Peckham. Taking it's title from the locale the boys have come to know as home, the record channels a delicate late night energy - equally indebted to the hypnotic incantations of Ron Trent as it is to the hazy suburban atmospheres of Burial. These 4 classic cuts pay homage to deep house in it's truest sense - at once sublime, melancholy and meditative . Chaos in the CBD have clearly taken their cue from the mid-west masters of the genre but have not been afraid to let their own influences and environ creep in, and in doing so have created something that is unmistakablely London and infact, timeless.